Got some dinged-up wooden furniture? For the smaller dings, rub a walnut over 'em. When you travel, you can roll up your ties and put them in your shoes to prevent them from getting wrinkled. My two-butch household doesn’t have an iron. We take our clothes immediately out of the dryer and hang them up, but if we forget, we just put our clothes in the dryer with a wet towel for fast de-wrinkling. Forget to squeegee for the last few months? Get soap scum off the shower door with a dryer sheet. Use a magnet to find nails and studs in your wall. Tired of trying to find the tiny "R" and "L" on your earbuds? Just color a little ring around the bottom of one of the buds with a Sharpie. Never spend money on "chip clips" or bag clips. Just use wooden clothespins instead--they're much cheaper. If you like making iced coffee at home but dislike your coffee getting watered down as the ice melts, make ice cubes using cooled coffee and save them in your freezer. Use those for your iced coffee instead. Wash out an old sunscreen bottle (needs to be one with a wide opening) and use it to store your keys/wallet/phone at the beach or pool while you're in the water. Safer than putting 'em in your shoe! If your toaster slots are big enough for two pieces of bread, you can make grilled cheese by turning your toaster on its side and using it as a little oven. Want to organize your dresser? Tiny bottles (e.g., from baby food or single-serve plum wine containers) make terrific containers for quarters, chapsticks, and collar stays. 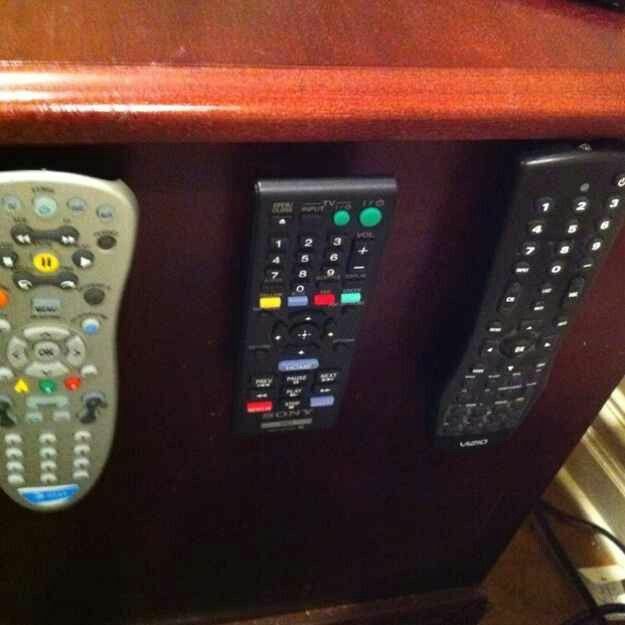 Velcro is awesome for keeping things like remotes, phones, etc. in place so you won't lose them. Another great organizer: wooden cigar boxes for pens, pencils, paper clips, ticket stubs, etc. Most eggs are good even 1-3 weeks past their expiration dates. Want to know if an egg is still good? Submerge it in a bowl of water. If it floats, it’s rotten; if it sinks, it’s still good. The easiest way to hang a bulletin board is to use a couple of nails and hammer it through the front, right into the wall. If you don’t have a flathead screwdriver, a coin often works well to loosen a screw. If you need a lint roller but don't have one handy, just wind some tape around your fingers (sticky side out) and use that instead. Out of saran wrap? Just put a plate on top of the bowl. It will keep stuff just as fresh, plus then you can stack other things on top of it to make more room in the fridge. Leaving a napkin on your seat (at a restaurant) or a coaster on your drink (at a bar) is the way to tell the waitstaff and other patrons that you'll be right back. To give day-old rice a fresher texture, just sprinkle it with a little water before microwaving it. Bored with the vanilla ice cream your partner favors? Mix it with a spoonful of peanut butter for ice cream that tastes like Reeses Pieces. If you mix a box of cake mix with a 12-oz diet soda, you can bake it just like that--no need to add oil or eggs or anything else. Got any of your own life hacks to share? Next will be the cake box and diet soda...to be continued...!